As everyone knows society has become very dependent upon technology and I myself am a total offender! I rely so heavily on my gadgets that sometimes I have to take a step back and laugh at myself. Did I really just use the calculator on my iPad to divide 100 by 20? It seems that I may be using technology a bit too much but hey, who isn’t? That said I thought I would give a shout out to my all-time favorite apps. Many you probably have heard of, used, or still use but who knows, maybe you will find a new favorite! The name alone is worthy of praise and an added exclamation point! I love being able to instantly know who sings a song and tag it to download later. Recently Shazam upgraded and now you can click a button and the words highlight along with the song. Gone are the days of making up your own words! This clever little app lets you send little e-cards from your mobile devise to anyone. Aside from having super cute images its also user friendy. Not to mention, it has really clever little cards. Check out the funny sections, they have some hiliarious options to brighten any ones day! It’s like having a little scanner right on your phone. I am HORRIBLE with receipts. This clever little app lets me take a photo of a receipt and email it to myself as a PDF. Long gone are the days of losing receipts before I even get out of the store! Everybody knows that things go fast on Craigs List. This app allows you to keep up and be the first to see knew listings. Just set up your search parameters and you get an update on your phone every time something that meets your requirements is posted. Genius! If your like me you probably repeat your mantra of “I have nothing to wear” at least five times a week. Well, this handy little app lets you catalog your clothes and create outfits. Create closets with your clothes, create outfits, and create packing lists… super fun and a great way to remember what you have in your closet! No matter how you relate to electronic gadgets and gizmos they aren’t going to go away. In fact more hit the market every day and some of them can make life a bit easier once you get in the habit of using them. 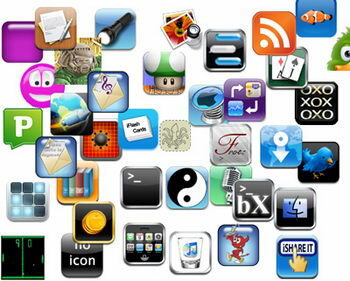 Since I am addicted to the world of apps, I’d love it if you would share some of your favorites with me too!